Happy birthday Leonard Everett Fisher (The Great Wall of China), Kathryn Lasky (The Guardians of Ga’Hoole series), and Jean Marzollo (I Spy series). It’s the birth date of John Ciardi (1916-1986), You Read to Me, I’ll Read to You. In 1983, astronauts Sally Ride, the first U.S. woman in space, returns from six-day mission on Challenger. Read To Space and Back by Sally Ride with Susan Oakie, Exploring Our Solar System and Mission: Planet Earth, both by Sally Ride and Tam O’Shaughnessy. In 1997, the U.S. Air Force reports on the “Roswell Incident,” stating it was life-sized dummies, not aliens from a UFO, witnesses saw in 1947. Around this time of year the Squire Creek Louisiana Peach Festival takes place with a rodeo, parades, and a cooking contest. If you are in the area and want some local culture, the next two days will provide that and more. 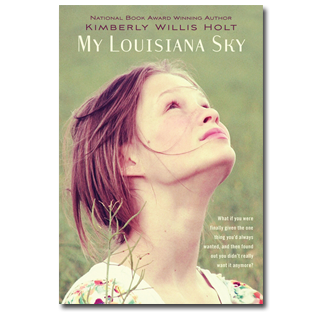 But if you aren’t, I have an alternative: Kimberly Willis Holt’s My Louisiana Sky, for young readers ages ten through fourteen. The daughter of a naval officer, Holt became an observer of cultures other than her own at an early age. Growing up in Louisiana, now living in West Texas, she has crafted a series of unique, emotionally moving, and beautifully written novels that resonate with a Southern voice. As she has written, “I don’t think I’ve ever really gotten over being twelve,” and her young protagonists all bear witness to the fact that she remembers, in exquisite detail, what it feels like to be a young child. I personally fell in love with her voice in 1998, shortly after the publication of her first novel, My Louisiana Sky, winner of a Boston Globe-Horn Book Honor Book award. In this unusual book, Tiger, a twelve-year-old girl living in a small Louisiana community, has a mother and father who have both been described as “simple” or “retarded,” and yet Tiger herself is smart as a whip and quite responsible. Her grandmother cares for Tiger and her parents. When she was young, Tiger could play with her mother as a friend. But now Tiger has grown older, and her mother has remained developmentally around six years old. Holt shows Tiger’s consternation about the actions of her parents—and how they affect her social standing. But Holt also presents both parents with dignity. Tiger’s father provides reliable work at a local plant farm; he even helps save the stock by correctly reading the weather signs of an approaching hurricane. Her mother’s love is simple and deep; a gentle soul, she supports Tiger completely. When her grandmother dies, Tiger must make the choice of whether she should leave what she knows to live with her aunt in Baton Rouge. Although this story requires a reader who enjoy depth and complexity in novels, for the right child at the right time, it can be amazingly rewarding. These readers often say My Louisiana Sky is the best book they have ever read. I love the honesty of the story, and the portrayal of how families and small communities can care for the disabled with love and charity. It brought back vivid memories of my own uncle Richard who provided a home and family for his blind brother and blind sister-in-law on a small Ohio farm. Kimberly Willis Holt always gets family dynamics and human relationships right. She is one of those writers I have always wished I could have coffee with in the morning. The next best thing is savoring her novels, including When Zachary Beaver Came to Town or Keeper of the Night. With an attractive new paperback cover, My Louisiana Sky makes a wonderful starting point for those who might have missed this singular writer. I rubbed the cloth viciously over an old scratch. “I didn’t say that.” I felt the shame of speaking my mind, but Granny was the only person I could talk to. Maybe she could shed light on my feelings for Momma and Daddy. Originally posted June 24, 2011. Updated for . I LOVE this book! My mother and I listened to the audiobook when I was younger and it’s another of those I considered one of “my books”, that I alone could totally relate to. There are several people with cognitive disabilities in my family, and so Tiger’s struggles felt so very real to me, and the setting and period were incredibly well drawn..
Chelsey: Thanks for commenting on the book and your response to it when you were a young reader. Oh, Anita, how have I missed this one? Again, you just make my tbr pile get a little higher, thanks! Jeannie: This is a very special book. I hope you get to it soon. My, my. Such an ocean of books, and such a small boat. I’ll net this one, and put it on the reading list, but I’m going to have to build a Super cargo ship for my children’s books soon. Loved the excerpt. While we have this book in our library, I suspect it hasn’t been checked out too recently. So, I’ll be reading it this summer to get it in the right hands during the upcoming school year. Replacing our copy with the above paperback will also attract more readers; book covers are sooo noticed by students! Thank you for sharing, Anita! Thank you for this one. Often when working at the Branch Library children (or parents on their behalf) are looking for a good realistic fiction book. This one sounds great. I will add it to my list as well. It is wonderful to have books that exemplify a sense of community and charity.